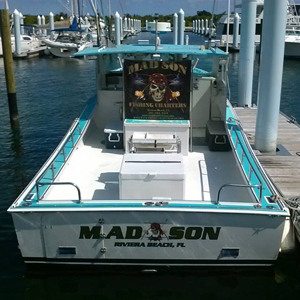 Mad Son Fishing Charter is a South Florida fishing charter unlike any other. We specialize in creating fishing experiences for our clients that they remember for a lifetime. We are located in Lake Park, Florida—convenient to Palm Beach Island, Singer Island, Juno Beach, Jupiter and West Palm Beach. Learn more about our Captain and vessel and you will see why so many of our clients choose to come back to Mad Son again and again. Captain George took over the Mad Son in 2013. However, his experience on the water stretches back decades. George grew up in Cape Cod and caught his first fish at age three. He obtained his captain’s license at age 18 and has worked on or ran boats ever since. 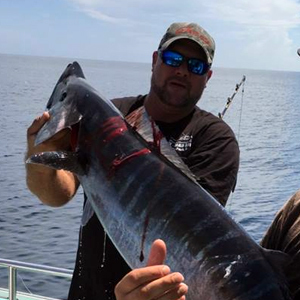 He has chased tuna and billfish from New England to the Virgin Islands, operated charter fishing boats out of Jupiter to Ft. Lauderdale and has managed a couple of local dive boats in between his sport fishing career. He has learned about, sought after, and caught just about every species the eastern seaboard has to offer, from bass to billfish. In his free time, he enjoys camping and fishing—both at sea and in the backcountry. Captain George has a bit of fame outside of the Mad Son too. He has won local tournaments, spoken at many fishing clubs, been featured in Florida Sportsman Magazine, and you can hear him speak on Florida Sportsman Live radio show on ESPN Radio. The “Mad Son” is a 38’ Young Brothers built in 1996 for Lobster fishing in Maine. The boat has since been customized for the needs of a fishing charter in South Florida. Safety is a priority and our boat is inspected daily and is up to date on all licenses and certifications. There is plenty of space on the Mad Son for six passengers and our crew to move around comfortably. The boat is equipped with a restroom for your convenience. If you have any questions, or you would like to set up a private charter for your group, or participate in a “multi-group” charter, call us at (561) 324-3454. George and his crew look forward to seeing you aboard the Mad Son!